The small town business owner today has lots of new channels available to use in getting their marketing message out. Yet that very factor, since many of these channels are using online media tools, makes business owners nervous on which channel to use and how to use it effectively. The reality is that the choice of channel or tool should focus on three key elements that research notes as influencing good marketing. Get your business involved in your community. 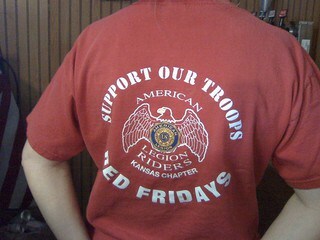 All the staff at the Cafe by Mike’s had their Red Fridays shirts on. In Medicine Lodge, Kansas. Photo by Becky McCray. The use of thought leaders, or those people respected in the community, as people to help build your market. Getting involved in the community and getting the community involved with you. Capitalizing on the unexpected or taking advantage of trends, breaking news, or any opportunity to get your name and product in front of your intended audience. As you think about these elements, you can see that the means of communicating, or the tool, is somewhat secondary. Online marketing has benefits .Yet we also know that the traditional tools need to remain in the marketing plan for most small-business owners. What many business owners find as their most effective marketing is probably a blend of traditional and online tools. Traditional marketing means have been and will continue to be effective. Yet the ability to reach customers through online marketing can be amazing, But many owners have yet to take advantage of the opportunities. Often the owner’s fears about using online marketing are twofold. First, they are into an area that is new and thus scary. Second, they think that adding something new will create more work. The reality is very different. Most owners already are involved in activities that fit well into an online marketing effort. Whichever of the three key elements of marketing used, thought leaders, community participation and using the unexpected, each can, with often small adjustments and a minimal time commitment, be used in one or both major categories, traditional and online, of marketing. In terms of thought leaders, the goal is to get their buy-in, use, and testimonials about your product and or service. This helps establish your reputation and your brand. Their involvement is the same whether using traditional or online marketing. Business owners also must be involved in the community. Research has shown that community involvement can mean greater business returns. Similarly, online community involvement can bring greater visibility and potentially greater sales and profits. Finally, business owners understand the need to remain flexible in their marketing efforts. Small businesses are in a perfect position because they can shift their marketing efforts quickly, based on an analysis of trends and changes. Again, this is true for online and traditional marketing. None of this should give the impression that there is not extra work to do or that it might not take some additional time. Marketing is marketing. The key concepts apply no matter what tool you use. Business owners need to take advantage of all the possible tools at their disposal. The idea is to use the tools that their target audience uses. The take-away message is that business owners do the same tasks. They simply need to change the medium, or even better use multiple media, for transmitting the message.